I just put two new 360/180 degree panoramas online, of places very well suited for an exquisite dinner. My friend Lee-Ann had her birthday party last weekend; she got the mythical age of 10! Of course we celebrated until deep into the night (really! She's a monster, only got tired at 1:30!). We had a party tent, barbecue and a nice fire going, and to capture the atmosphere I took a 360° panorama. Here you can see both versions of the same photo - I made a "streetview" image as well as a miniature planet. The photo was made from 92 individual photos, HDR-merged and stitched with Hugin. Drag your mouse to look up, down, left or right. Scroll to zoom. Double-click for full screen. This is the center part of my office building. I took some photos there today (84 in total), and stiched them together with Hugin. Post processing with Bibble Pro and ImageMagick. The details about how I created this photo are after the break. This panorama shows something that I quite often see; the people here are waiting for the ferry to cross the IJ (the lake that separates the northern part of Amsterdam from the rest). Look around by dragging, use your scroll wheel or page up/down keys to zoom. Double-click to view full-screen. This photo is hosted by Flickr. This time I used Hugin for remapping and aligning the photos, but I merged them by hand in The Gimp. It's quite an easy process, and it gives you much more control. I took the photos without a tripod or any other form of support, so not everything lined up perfectly, which is where the manual control came in handy. 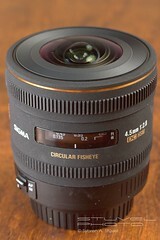 2010 Sigma 4.5mm Fisheye - What's it like? This lens is insane. 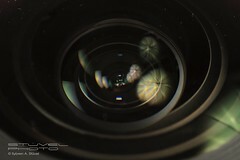 It's the world's first circular fisheye lens for APS-C sized sensors, and the first fisheye lens that I own. Looking through the viewfinder for the first time was a strange sensation. The view was both very restricted due to the circularness of the lens, and very wide at the same time due to its 180 degree view all around. For those not intimate with fisheye lingo, "circular" means that it projects a circle on the sensor. Outside of the circle everything's black, inside the circle you have a 180 degree view from left to right, and top to bottom. So far the best us APS-C shooters could get was a "diagonal" fisheye, which means that you only get a 180 degree view from top left to bottom right. Horizontal and vertical would be less than 180 degrees. From the first moment I saw the lens I knew that I just had to have it.... the only downside is the price tag. 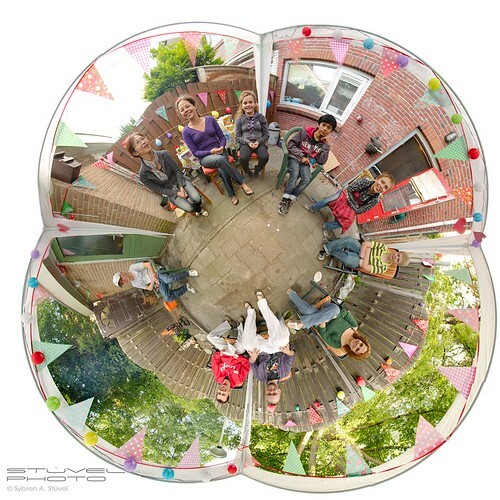 At €650,- it's not the cheapest of lenses, but it's not that insane compared to other fisheyes. Sigma isn't known for their good quality control. The shop I bought the lens at had three of them in their magazine, and the first two had uneven coating on the front element. The store personnel told me that it wouldn't show on photos, but nevertheless they let me inspect all three lenses, and one of them had perfectly even coating. For that price, I wanted to make sure I got the best one. I used the lens on my Canon EOS 7D, so besides having a high resolution of 18 megapixels I could also give it a go with video. And boy is it fun! I don't have a professional setup where I can measure things like distortion or colour metrics. Instead I'll tell you about practical results I got with this lens, and how they look with my two eyes. The photos you see here are also processed a little bit. Unprocessed photos from a digital camera always look a bit flat and soft, so I don't think that presenting you with such photos would be a true demonstration of the capabilities of this lens. The lens feels very sturdy. The build is solid, and with a metal mount it attaches firmly to the camera. At the rear there is a gelatine filter holder, and you even get a small metal plate you can use to cut the filters to size. I feel that this filter holder is of limited use, unless you want to insert ND filters. As the holder doesn't rotate you can't really use polarizers or graduate ND filters. Going further towards the front of the lens, we meet the distance scale. It has three marks: 13.5cm, 20cm and infinity. Remember these distances are measured from the sensor; it can focus really, really close. The hypersonic motor (HSM/USM/whatever you want to call it) does its work quickly and silently. The focus ring is all the way at the front, and rotates smoothly. I would have liked it to be a bit further backward, though. My hands are quite big, and it's just too easy to get some digits into the frame. Every bit of finger that sticks out from the focus ring will get photographed, so be careful with that. 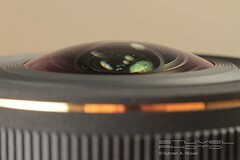 The front element bulges out of the lens, to be able to capture the 180 degree view. The lens cap comes with a metal ring so that it can fit around it. So, remember to remove the ring as well as the lens cap, or you won't get the full view. The maximum aperture is f/2.8, which is a tad slow for a prime but quite good for a lens this wide. Combined with the short minimum focus distance you can even use it to blur the background. A little. The wide aperture is more useful for low-light shots; it also means that the viewfinder is bright, and that your autofocus has more light to work with. The centre sharpness of this lens is amazing. Even at very close range - which is where you want to be with a lens like this - it is very sharp. Towards the edges it has some serious chromatic aberration and purple fringing in high-contrast areas. As it's my first and only fisheye lens I can't tell you whether this is more or less than others. I just know that it's very difficult to bend light and keep all the colours where they should be, and at the edges that light is bent a lot. The photo below has been corrected, the photo of the Volkswagen van up top hasn't been. The lens flare looks really nice, as it doesn't stick to the circular projection - it breaks the frame, so to speak. Of course if you don't like it you can always mask it during post processing. The flare shows that the aperture has six blades. I would have liked one more - I like odd flare streaks more than even ones. The aperture makes more noise that I would have expected; more than any other lens that I own. Now this isn't a lens you can use stealthily anyway, as you'll have to get right on top of the action or it'll get really, really small, so a bit more aperture noise isn't a practical issue. The wide view makes this lens very suitable for panorama shots. With only two photos you'll be able to capture the entire view around you. However, you won't be able to stitch them together very well; at the edges the quality goes down, and there wouldn't be much of an overlap anyway. So rather than using the minimum, I used six shots: north, east, south and west, and straight up and straight down. And since I was shooting a library with mostly black architecture and large windows with a bright sun outside, I tripled every shot at -2 EV, 0 EV and +2 EV to merge them later as HDR photos. The 7D with its 7 photos per second just whirred through those three shots per direction. The panorama is hosted by Flickr. Double-click to view full-screen, drag to look around. Before I started stitching the photos I loaded the RAW files into Bibble Pro 5.1 and removed most of the chromatic aberration (C/A). With a few clicks the C/A was as good as gone, and since I had a nice overlap between different shots the remaining C/A wouldn't pose any problems. The 18 RAW files were exported to 16-bit TIFFs (100 MB a pop) and then loaded into Hugin. In Hugin I manually placed control points, about 5-7 per overlap, optimized the photo and let it do the stitching and HDR processing. Hugin is very good at producing realistic HDRs. Many HDR programs first create a photo with a huge dynamic range and then try to compress this range using tone mapping. This can easily produce those super-saturated, artificial looking photos. Hugin blends between "real" pixels, ignoring ones that are under or over-exposed, blurry, etc. and keeping the good looking ones. This process gives a much more natural result. After exporting the photo in "equirectangular" projection, I loaded into the Flash application by pan0.net so that you can look around in it. The zenith (look straight up) isn't perfect yet, but I'm sure I can fix that if I spend enough time on it. Also know that I took those photos without any tripod or panorama head. The lens is nearly perfect for video. The video below shows a view from my Renault Twingo. The music is by my band (I'm the drummer) The Soundabout, and the drive is from our practice studios to my home. Click on the cross-like thingy at the bottom of the video to view full screen. 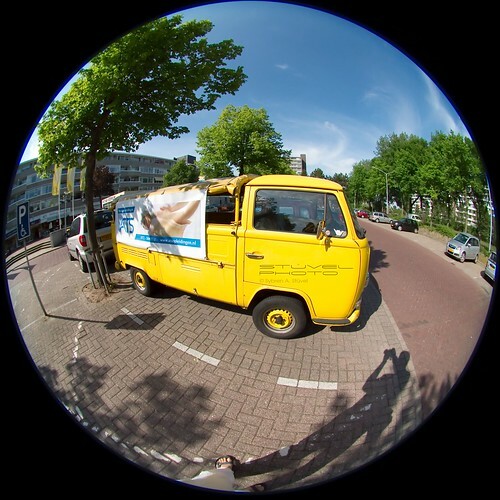 A quick drive through Amsterdam from Sybren A. Stüvel on Vimeo. So yes, it's good but just not quite perfect for video. It's more an issue with my 7D than the lens, to be honest. At those lovely modern and crispy 16:9 HD resolutions the camera crops a few pixels off the bottom of the circle - I would be much happier if we would have gotten a true 3:2 high-resolution video format, so that the entire frame could be captured. So Canon, if you're reading this, pretty please with sugar on top, add a 1920x1280 or 1620x1080 video format! As I said, I drum in a band. 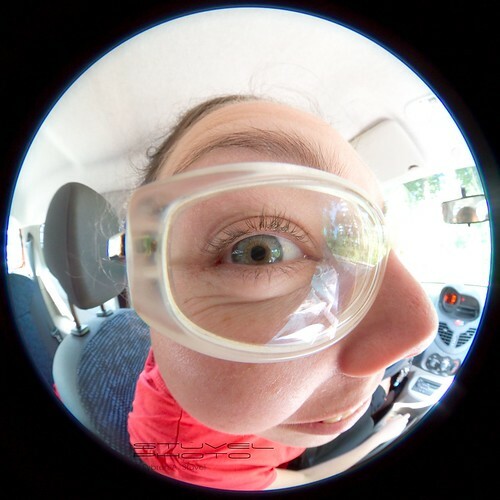 My girlfriend sometimes records our performances on video, and will of course start using the Sigma fisheye lens for this. Keep an eye on our website! This lens is unique. The results are very pleasing, and most importantly: it's great fun. It's really different from anything else in my photo bag. The price is a bit steep, but given the quality and the fact that they won't sell that many of them, I think it's justified. If you want to easily shoot 360 panoramas, record edgy videos or otherwise use an incredibly wide field of view, this lens is for you. This article was also published on Digital Photography School.